Might & Magic is a new strategy game for mobile devices by Ubisoft in which you build the best team of best creatures and fight against monsters, dragons. The game also features PvP arena mode. All you need to do is to assemble the team of strongest creatures. However, it would not be easy. Might & Magic Elemental Guardians game features 400+ creatures. In this post, we have covered everything about the game you need to know: Might & Magic Elemental Guardians guide and Might & Magic Elemental Guardians tips, cheats & strategy to assemble an ultimate team of best creatures. Before we head to the main guide, cheats, tips & strategy part, let’s learn the basic. The game features two game modes; story and PvP. In story mode, you start the journey from Floating Islands and end it by completing all the stages of Wastelands. At the end of each Island’s stage, you will have to defeat the dragon to unlock the new Island. You can play each stage in three difficulty modes; normal, advanced, and nightmare. In normal mode, the amount of reward is low and in the nightmare mode, the amount of reward is high. To play advanced & nightmare mode, the player has to complete all the stages[normal]. Once you complete all the stages in a particular difficulty mode, you can use the simulate ticket to get instant rewards. In the arena mode, you fight against other players from all over the world. Your objective is to build the team of best creatures and top the leaderboard. 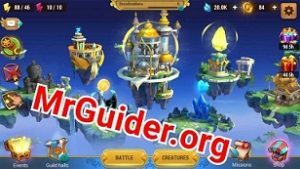 Let’s start the Might & Magic Elemental Guardians guide and after it, check out Might & Magic Elemental Guardians cheats tips & strategy. 1.) Might & Magic Elemental Guardians Walkthrough To Start Like A Pro! The concept of this game is quite simple. There are lots of creatures; 1-star, 2-star, 3-star, 4-star, and 5-star. At the beginning of the game, you have three 2-star creatures. Once you complete the floating Island(normal mode) or reach the level 5, you will get seal coins or soul-stones as a reward. At this stage, you can summon a 2-star creature by spending 130 seal coins/gold coins. That’s it. Now, you have a team of 4 creatures(2-stars). But, with this team, you can not beat the enemies in nightmare mode. So, you have to increase the power of your creatures. Read the creatures guide below to know how to increase the power of creatures. As you know, you can not beat the powerful enemies with 2-star creatures. So, you need at least 3-star creatures team. And there are very low chances that you will get a 3-star creature using summoning. Ranking up a creature increase the stats, level-cap, and the number of stars. For instance, at level 5, you have 4 creatures(2-stars). And the maximum level of a 2-star creature is 20. At level 20, you can rank-up a 2-star creature. Ranking-up increases the level cap, stars(from 2-star to 3-star), and stats(HP, speed, DEF, ATK, and more). 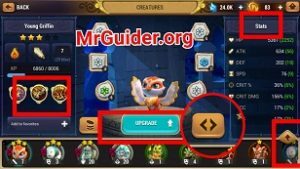 In short, you should not spend the crystals in upgrading all the creatures you have. You just have to focus on the best 4-star creatures; upgrade, evolve, rank-up, skill-up, and you are good to go. How to check which creature is best and which creature is not? There is a compare option available-> on the main screen -> tap on the creatures -> then tap on the <> button. As you know, there are lots of creatures in this game. It’s very difficult to choose which one is best or which is worst. And for ranking up, you have to sacrifice creatures. You should not sacrifice the creatures blindly; it might be better than the creature you are going to rank-up. So, make sure to compare both the creatures. Might & Magic Elemental Guardians Tier List(Credit – Reddit(MMEG)) ⇒ Download Here. It would be better to install MS Excel app on your mobile device to open this file. Password: MMEG(If prompt). Use the find option and enter the name of the creature. Check out this tier list and search for “creatures” you have. Why should you check out this tier list? To upgrade wisely(By comparing). Before upgrading, check out; is it worth upgrading or not! T.O.Trials(In Tier List) stands for the tower of trials. In this part, we will learn about creatures, leveling-up, hero, skill, evolve, summoning, and much more. You can select up to 4 creatures for the battle. As you progress, the power of enemies will increase and it would be hard for you to get victories in these stages. So, you should increase the power of creatures. There are a number of ways to increase the power; level-up, rank-up, skill-up, evolve, equip glyph, upgrade, glyph, and more. Let’s learn about all. You need XP to level-up a creature. You can obtain XP by getting victories in the battle. In Might & Magic Elemental Guardians game, you can also level-up a creature using the potion. Potions are of many types; normal, rare, legendary. You can obtain potions by completing the daily missions or achievements. To use the potion, go to creatures section of the game -> select a creature you want to level-up -> upgrade level -> choose the quantity -> that’s it. One of the best ways to level-up a creature is by repeating the advanced or nightmare stages in story mode. 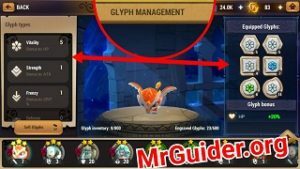 If you get stuck on a stage, it would be better to increase the power of your team by leveling-up or equipping the glyphs(glyph guide is below). When one of your characters reaches the maximum level, you can rank-up it. Ranking-up also increases the level cap+stats+stars. To rank-up, go to creatures tab -> upgrade -> head to the rank-up and confirm. You can use other creatures for this purpose. For instance, you have a rank-1 creature, to increase its rank to 2, you will have to sacrifice two creatures. You can not get back used creatures, so make sure to check the tier list and find out; is that creature good or bad. If it’s good, then you should keep that creature. If it’s bad, then use it in ranking-up. In Might & Magic Elemental Guardians game, each creature has its own unique skills; the player can increase the skill power by upgrading the skill. It costs you magic book and skill material(play in dragonmist Islands-> elemental tower for this material). For example; if you want to upgrade the skill of a fire type creature, then you need fire creature’s material. How to obtain? Battle -> Dragonmist Islands -> Elemental Tower. And you should upgrade the skill as fast as possible because, in the battle, we use skills to defeat the enemies. And with low-quality skills, you can not beat powerful enemies. Evolve a creature to increase the stats and to obtain a new appearance. It costs you evolving material and magic book. You can obtain magic books by completing the daily missions and achievements. Or play in the arena, earn reputation points -> shop -> spend reputation points and grab a magic book. How to obtain evolving material? Main Screen – battle -> dragonmist Islands -> Tower of Houses. To increase the various attributes of creatures, equip them with Glyphs. Glyphs are of many types; common, uncommon, rare, and legendary. You can obtain glyph by playing the story mode or battle -> dragonmist Islands -> Glyph Dungeon. For example; if you want to increase the defense of a creature, equip defense glyph. To increase the attack power of a creature, equip strength glyph. Go to the creatures tab -> tap on the + icon(empty slots), select the glyph -> equip. Tap on a glyph -> upgrade it to increase its power. You can activate the glyph bonus by equipping 3 glyphs of the same type. Read Might & Magic Elemental Guardians strategy guide below to learn more about the glyph bonus. You can obtain soulstones(epic+legendary+epic) by completing the achievements. Fragments can be obtained by playing the story mode or in dragonmist Islands. Earn reputation points by playing in the arena mode and spend reputation points in the shop to obtain these elemental soul stones. To open the chest, you need keys. Complete the achievements. The only way to obtain special soulstones for free in Might & Magic Elemental Guardians game is complete the events. As of now, there is an event; I will get the supreme soulstone after summoning 150 creatures(2-stars). These events last long for 28 days. Well, if you really want to get a 4-star creature fast, take the event seriously. Main Screen -> at the top of the screen -> tap on your name or hero’s name to go to hero info panel. At the bottom-right -> tap on the skills -> here you can upgrade the hero’s skills. It costs you skill points. Each time you level up, you get a skill point. In the battle, after some time, hero’s spell gets charged. Tap the spell icon to use it. To increase the spell effect, upgrade the hero skill. Well, there is no way to reset(because they store the progress on their servers). But you can start the game from the beginning by using a new Google Account. 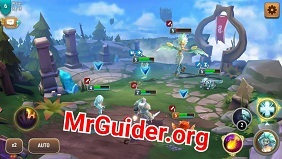 Go to the mobile settings -> apps -> M&M Elemental Guardians -> clear data. Open the game again -> connect to the new Google Account. Or drop a mail to their support team. So, this is the basic Might & Magic Elemental Guardians guide for the beginners. Now, let’s start the Might & Magic Elemental Guardians cheats, tips & strategy. Well, you have limited crystals and crystal is one of the precious items in Might & Magic Elemental Guardians game. Crystals are required to upgrade the level, ranking-up, glyph upgrading, and in many more tasks. Since the amount of crystals is limited, you should spend it wisely and only on the best creatures. But you may not know which character is best and which is not. For example; I have 20 creatures(2-stars). I cannot develop all because the crystals are limited and for the battle, I can select up to 4 creatures. So, what should you do? It’s simple, compare! Download the tier list(link is given above) and find out the best creatures you have. Play arena and strike down the enemy team. Earn Reputation points and spend them to get precious items like fragments, magical book or more. Don’t forget to set up the defense in arena mode. You can play each stage at an Island in three modes; normal, nightmare, and advanced. Play advanced and nightmare mode to earn precious items like epic, minor fragments, seals, and much more. Don’t forget to repeat. Join an active guild. Complete the guild quests and earn guild points. Use guild points in the guild shop to get precious items like bright fragments, epic potions, legendary glyph, crystals, and much more.